LONDON, England (CNN) -- An oil deal and trade concerns with Libya were at one point considered as factors in the Lockerbie bomber's release, Justice Secretary Jack Straw said in an interview published Saturday. 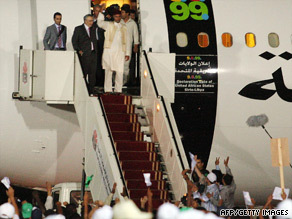 Abdelbaset Ali Mohmed al Megrahi (second from left) arrives in Tripoli, Libya, on August 21. Ultimately, convicted bomber Abdelbeset Ali Mohmed al Megrahi was released on compassionate grounds because he is dying of cancer, a decision that Scottish, British and Libyan officials have said was not linked to oil or trade. In an interview published Saturday in The Daily Telegraph, Straw said trade and the interests of oil giant British Petroleum were factors in a 2007 prisoner transfer agreement between Britain and Libya. "Yes, (it was) a very big part of that," Straw told the paper. "I'm unapologetic about that. ... Libya was a rogue state. We wanted to bring it back into the fold. And yes, that included trade because trade is an essential part of it and subsequently there was the BP deal." A Straw adviser said Saturday that Straw's quotes were accurate, but he emphasized that al Megrahi was not released under the terms of that deal. "Jack's position has been on the record for some days," said the adviser, who declined to be named in line with policy. "He has never denied that seeking an agreement with Libya over a prisoner transfer agreement was connected to a wider process of normalizing relations with Libya, including on trade, which is in the interests of us all." Scottish Justice Secretary Kenny McAskill decided last month to release al Megrahi, who was serving a life sentence for the 1988 bombing of Pan Am flight 103 over Lockerbie, Scotland. The bombing killed 270 people and was the world's most fatal act of terrorism until the Sept. 11, 2001 attacks, according to the FBI. McAskill said he made the decision on compassionate grounds because al Megrahi, a Libyan, is terminally ill with prostate cancer. The prisoner transfer agreement between Libya and the United Kingdom -- which covers Scotland -- was not a factor in al Megrahi's release. "I made it clear that for us there was never a linkage between any other issue and the Scottish government's own decision about Megrahi's future," Brown said. "On our part there was no conspiracy, no cover-up, no double-dealing, no deal on oil, no attempt to instruct Scottish ministers, no private assurances by me to (Libyan leader Moammar) Gadhafi." Abdulati Alobidi, the Libyan minister for Europe, backed up the denials. "In my negotiations with the British and the Scottish, I didn't mention anything about trade relations," he told Sky News this week. Scotland fought hard to keep al Megrahi out of the prisoner transfer agreement, which was negotiated in 2007, according to declassified government documents released this week. Days after that, Libya approved a huge oil exploration contract with BP. It means Britain -- not Scotland -- gave in to Libyan demands that al Megrahi be eligible for transfer, even while insisting that the actual decision about whether to transfer him would be Scotland's. Ultimately, however, "the prisoner transfer agreement never came into play" in al Megrahi's release, the Ministry of Justice spokesman said.